Mian Ghulam Shah Kalhoro (d.1772) Sindhi: ميان غلام شاه ڪلهوڙو ) was famous ruler of the Kalhora Dynasty whose rule began in 1757 when he was appointed ruler of Sindh by tribal Chiefs of kalhora replacing his brother Mian Muradyab Kalhoro. He was recognized and bestowed upon title of Shah Wardí Khan by Afghan King Marathas and their permanent vassal the Rao of Kuchch in the Thar Desert and returned victoriously. 7 Matrimonial connection between the Mián and the Ráo of Kachh. 10 The death of Mián Ghulám Sháh. Mian Ghulam Shah was son of Mian Noor Muhammad Kalhoro who fought the forces of Nader Shah when later had invaded Sindh and taken the sons of Mian Noor Muhammad Kalhoro as hostage to Persia. Ghulam Shah remained the only legitimate heir of the Kalhora Dynasty. In 1762, Mian Ghulam Shah Kalhoro and 8,000 Sindhi Sowars ventured into the inhospitable Thar Desert in order to defeat the forces of the Rao of Kuch, a prominent vassal of the Marathas, who had been threatening the loyal subjects of the Kalhora Dynasty. Due to his cannons and superior firepower, Mian Ghulam Shah Kalhoro and his 8,000 army defeated the Rao of Kuch and returned victoriously. Mian Ghulam Shah Kalhoro celebrated his return by constructing a mausoleum upon the grave of the great Sufi poet and saint Shah Abdul Latif Bhittai. In 1763 AD, Mian Ghulam Shah Kalhoro led his Sindhi forces and marched beyond the Thar Desert towards the Rao of Kutch in order to punish the Jadeja, raiders of the Kathiawar region. He took the fort of Sindhuri and built the fort of Imamgarh on his way to the Kutch region, and on the heights of the mountain of Jarah. Mian Ghulam Shah Kalhoro and his Sindhi forces armed with gunpowder killed about 6000 zealous JadejaRajput warriors. Continuing his victorious march he entered the massive fort of Bhuj, plundering the villages and towns in the vicinity of that Jadeja Rajput stronghold. He took the seaports of Busta and Lakhpat. But when Ráo of Kuch sought to pursue a peace treaty with the Sindhi army led by Mian Ghulam Shah Kalhoro, the Sindhi forces consolidated their position thus expanding the realm of Sindh. 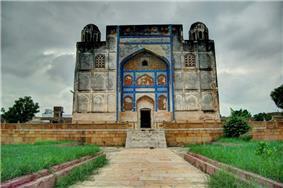 Mian Ghulam Shah Kalhoro, arrived at Shahpur in 1764 AD after his long and arduous campaign in the arid and dry region. In 1765 AD Mián Ghulám Sháh again invaded Kachh and took the fortified town of Mórú on his way. Coming to within 10 miles of Kachh, he made a halt. The Ráo of Kachh again applied for peace and a fresh treaty was concluded. Returning from Kachh he went to the old Sháhpúr instead of the new, which town he found uncomfortable on account of the excessive wind and dust. About this time the king conferred a fresh title of “Samsámuddaolah” on Mián Ghulám Sháh, in addition to the former one, in consideration of his brave deeds and successful management of State affairs. In 1767 AD Mián Ghulám Sháh was entrusted by the king with the charge of the Derahs whence some disturbance was reported. Accordingly in the beginning of Rabíussání, the Mián started for that division. In the course of three months he settled all matters and restored peace and order there. Taking some hostages from the chiefs of the place, he returned to Sháhpúr. Unfortunately during this interval, the force left by the Mián at the Derahs had to fight with the natives of the place headed by their chief Nasrat. This confusion induced the king to send Sardár Jahán Khán as his agent to settle and administer the State affairs there. The Sardár came, dismissed the Mián’s officers and appointed his own in their place. In 1769 AD however, Derah Gházi Khán was lost to the Sardár, and Mián Ghulám Sháh had again to go in that direction to settle the country. He succeeded in restoring normalcy in the country once more. And as a reward for this remarkable piece of the service, the remaining portion of Derah Gházi Khán, that used to be attached to Multán, was given to the Mian Ghulam Shah and its governor made subordinate to him. In 1769 he sent Sardar Jahan Khan to gain Multan but later the Sindhi and Multani forces had to confront the threat posed by the Sikh forces led by Ranjit Singh that began to conquer Multan. However the campaign did not succeed beyond Dera Ghazi Khan. Matrimonial connection between the Mián and the Ráo of Kachh. In 1770 AD for several reasons the charge of the Derahs was taken from Mián Ghulám Sháh by the king and given back to Sardár Jahán Khán. In this year the Ráo of Kachh gave the hand of a daughter of his cousin Wesújí in marriage to the Mián and the marriage was celebrated with great pomp and splendor on both the sides. In consideration of this relationship, the towns of Bustá Bandar and Lakhpt Bandar and others that had been conquered by the Mián, were returned to the Ráo. The Pacco Qillo was established in 1769 AD by Mian Ghulam Shah Kalhoro and had become one of the largest military garrisons in the region. 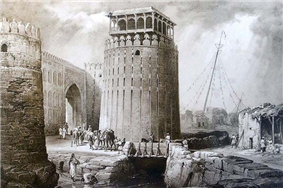 In 1769,the establishment of a new Fort at the site of Nerunkot (modern day Hyderabad, Sindh) completed. He had commenced the construction of a strong fortPacco Qillo in 1768 AD with a view of turning that place into his future capital.This fort, which was built on hilly high ground was named Hyderabad Fort where Mián remained for the rest of his life. After Gul Muhammad Khán Khurásáni and Muham­mad Káim no other administrator was appointed at Thatta. In 1770 AD, however, Habíb Fakír Náij was put in charge of the place. Habíb was succeeded by Muhammad Husain, but he soon returned and resumed the same charge. After Habíb was removed Murád Fakír Nizámání was made the administrator of Thatta and continued as such up to 11774 AD. The death of Mián Ghulám Sháh. In 1772 AD foundation was laid for a mud fort on a hillock to the south-west of the fort of Hyderabad and for the protection of the same. The hillock was sacred to Hají Muhammad Makaí and was called after his name. His remains had been buried there and round his tomb a spacious grave-yard had been formed. As a large number of tombs had to be razed to the ground to lay the foundation of the fort, it proved to be a bad omen on account of the disrespect that was shown to the dead, especially to the saint. Unfortunately, soon after the fort was built, Mián Ghulám Sháh died all of a sudden on the 2nd of Jamádil-awwal of the same year, having been attacked by paralysis on the previous day only.About this time Ahmad Sháh Durání died and with the Death of Ahmad Sháh Durání and accession of his son Taimúr Sháh to the throne. 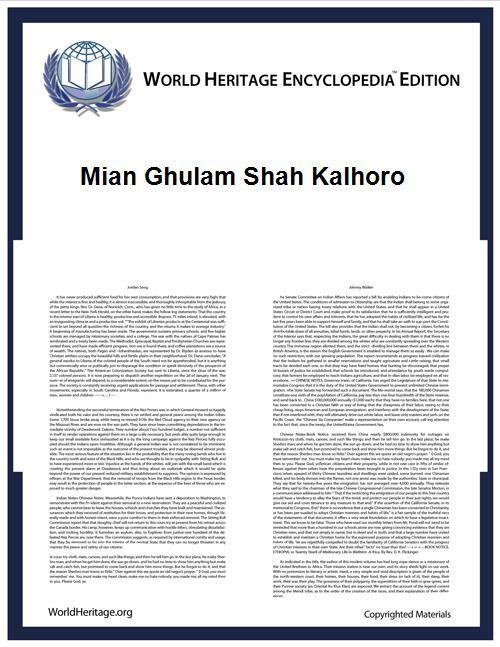 This article includes content derived from "History of Sind - translated from Persian books" by Mirza Kalichbeg Fredunbeg (1853–1929), published in Karachi in 1902 and now in the public domain.